Visalia, California. December 28th, 2010. Major road repairs in Visalia north of the state Highway 198 cutoff continue to be a concern, although much of the work has been completed despite December rains that slowed progress and increased costs. Of most concern is a 100-yard-long sinkhole that developed under a service road parallel to Shirk Street near Ferguson Avenue. 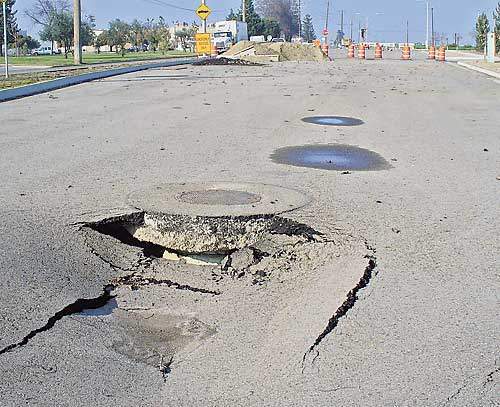 The broken asphalt caused by pressurized floodwaters under the service road is precariously close to Visalia’s newest fire station and training complex, which also houses the city’s hazardous-materials equipment and crews. A block of Ferguson had to be closed from Shirk to Denton Street — the stretch just north of the fire station — blocking the access road into the station. Likewise, access to the station from the service road next to Shirk is also shut down indefinitely. That left the south, where the Visalia Fire Department has removed part of the median and used a steel blanket to allow engines and firefighters to freely move in and out of the station. This entry was posted in Pictures and tagged California, flood, sinkhole. Bookmark the permalink.